Samsung’s upcoming M series devices, the M10, M20, and M30, are very busy leaking left and right these days, which implies that their official unveiling is not far off. Following its FCC certification yesterday, the Galaxy M20 is revealed again today- this time in the first ever live image of the phone. 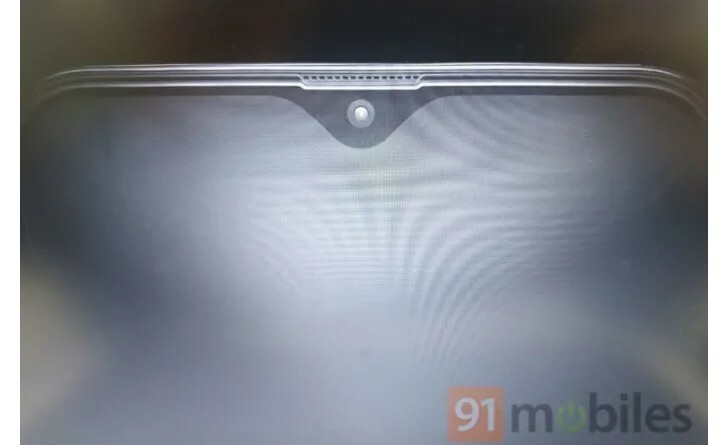 Well, to be more precise, it’s an image of a part of its front, which as you can see gives us a good look at the top display bezel as well as the Infinity-V notch that the M20 will employ. It might be smaller than you imagined it to be, and apparently there will be a breathing LED strip surrounding the notch. This will light up every time you unlock the phone. As for the bottom bezel, it’s rumored to be slightly slimmer than the one on the Galaxy Note9, which is definitely a good achievement for the M20, it being a mid-ranger and all. The picture below purportedly shows the M20’s screen glass and allows you to get a better idea of how the entire front of the handset will look. The Galaxy M20 is said to share most of its looks with the M10, although it will be thicker and slightly bulkier than that model. A dual rear camera setup (13 MP + 5 MP) will be on the back on the left side, with a LED flash underneath. The fingerprint sensor is also on the rear. The back itself is made from polycarbonate with a glass finish, which allegedly gives it a more premium look than your vanilla plastic. The device has a USB-C port at the bottom, where there’s also a speaker grille and a 3.5mm headset jack. The M20 has been rumored to come with a 5,000 mAh battery, the biggest Samsung’s ever put in a phone. Its screen size will be 6.13″ (with FHD+ resolution), and it may be powered by the Exynos 7904 SoC, paired with 3GB of RAM. For storage you’ll get 32 and 64GB variants. The notch will apparently house an 8 MP selfie camera.